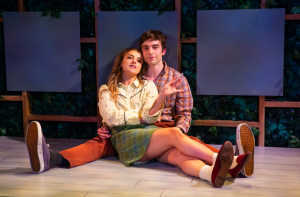 The Irish Repertory Theatre’s production of “Two by Friel,” a bill comprising two seemingly unrelated one-act plays by the great Irish playwright, Brian Friel, “Lovers: Winners,” and “The Yalta Game,” is a holiday gift come early. Beautifully directed by Conor Bagley on the W.Scott McLucas Studio Stage, “Two by Friel” is a necessary, and I mean necessary, theatrical experience. I cannot guarantee that you will be moved, or changed. But I was. “Lovers: Winners” (1967) and “The Yalta Game” (2001) were written over three decades apart. What could they possibly have in common? “Lovers: Winners” opens with a Man (Aidan Redmond) and a Woman (Jenny Leona) seated on opposite ends of the stage. Both read aloud from leather-bound manuscripts, so initially it sounds like a formal narration of an unfolding relationship between two teenagers. Then one after the other, the teens appear, both bearing book bags, and come to rest on top of a bucolic hill overlooking the town of Ballymore, Ireland. 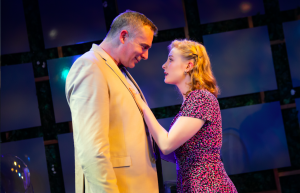 Mag (Aoife Kelly) is supposed to be studying with her beau, Joe (Phil Gillen), but has more pressing things on her mind. She is seventeen and two months pregnant. Joe is seventeen and a half and marrying her in three weeks’ time. It is a perfect summer’s day in early June, and Joe has just signed the lease on the flat they will live in, and if Mag puts a lace curtain on the kitchen window, the slaughterhouse it overlooks will be masked. Voluble and emotive, Mag is alternately joyful, terrified, funny, tearful, wants a real marriage – not separate beds like her parents – and is impatient for the future to hurry up and get here. Joe, by contrast, is quiet and studious – perhaps distracting himself from how much and how soon his life is going to change – but cannot ignore Mag, simply because she won’t stop talking. Though Joe cares for Mag, he has plans of his own to study math and become a math teacher. This sudden change in his life makes him irritable. At one point, during a tiff, he says to Mag, “You trapped me into marrying you!” This wounds Mag deeply, and twice he has to apologize; but in order to get back into her good graces, he makes her laugh mainly by doing silly impressions of people they both know. They are, after all, barely adults. Because of the mores of the times, both have been expelled from school, but are permitted to sit exams. They have brought shame on their families and shame their town, shame on their church. Standing on the hill above Ballymore, Mag says when she looks down, she wants to hug and kiss every one of the townspeople, but up close, she wants to punch them. Given the treatment the two have endured, it’s not hard to understand why. This is the beginning of young love taken at top speed. They are passionate, spirited, hurtling toward an unknown future. Both believe “It will be all right,” and they are in this – marriage, baby, hopes and dreams for the future – together. But as the Man and Woman periodically interject and more facts become known about Mag and Joe, it becomes clear that their formal narration is, in fact, a joint reading from an inquest. At one point, high on the hill in the sunshine, Mag says, “I think this is the most important moment of my life.” She has no idea how right she is, or how short and tragic two lifespans can be. Dmitry makes a beeline for Anna, and charmed by his personality and description of The Yalta Game, which she comes to play like a pro, she accompanies him sightseeing and eventually, to bed. Anna is torn by the affair and describes herself as a “fallen woman.” Dmitry remains enthralled but detached, and when Anna is suddenly called back to Pargolovo due to her husband’s pending hospitalization, he convinces himself that Anna was just another part of the Yalta game. After all, he reasons, she left before things got complicated. But Anna fell for Dmitry and carries him with her, through her empty house day after day while her husband is hospitalized twice. She never expects to see Dmitry again. It dawns on Dmitry over time that the compartments he has for his life are no longer working. They can no longer be separated. Anna got to him. He has fallen in love, too, and impulsively travels to where Anna lives to find her. This is a complication neither expected. They meet every two or three months in Moscow. It is blissful, it is thrilling, it is tortured. It is also unsustainable, and divorced from reality.“But how could I tell her this would come to an end one day?” Dmitry says, but Anna already knows, though she has not told him. All four of these actors are across-the-board fantastic. Moving. Heart-rending. Kudos to the effective Lighting Designer Michael O’Connor and Set Designer Daniel Prosky for making a small space feel as large as a hilltop and expansive as a town square. Mag and Joe’s relationship and Dmitry and Anna’s relationship are burgeoning, passionate, loving, reckless. Both end in tragedy. Both end before either can sour. Both talk about a future they will never have. Best to enjoy every moment then, every joy, every passionate kiss, while it lasts. By the same token, “Two By Friel” is a must-see. Theatre is ephemeral, so enjoy every moment, every joy, every heartbreak in this glorious production, while it lasts.